Steven McPherson has gone from wine collecting to winemaking with his 2004 Promise bottling from the Rutherford hills. Stephen McPherson, 44, is the president of ABC Entertainment. Since 2004 he has overseen the launch of such TV hits as Lost, Desperate Housewives, Ugly Betty, Dancing with the Stars and Grey's Anatomy. Even before joining ABC, McPherson was a Hollywood player, as vice president of prime time for NBC and president of Disney's Touchstone Television studio. An avid wine collector, McPherson recently spoke to Wine Spectator about his latest project, the first release of Promise Napa Valley Cabernet Sauvignon, which he produces in partnership with Frank Family Vineyards. Wine Spectator: You've just released your first wine, Promise Napa Valley Cabernet Sauvignon 2004. How did you get into winemaking? Stephen McPherson: I've been going to Napa for about 17 years. I got married there in 2004. One of my mentors in the industry is (the former president of Walt Disney Studios) Rich Frank, who owns Frank Family Vineyards in Napa. We decided to partner up on a really small, high-end Cabernet, based on some property in Rutherford, right on the hills near Auberge du Soleil. We're doing about 100 cases a year, with 2004 being the first vintage, and that's what's being released right now. We're also sourcing some Cabernet Franc, Petit Verdot and Malbec as blending grapes, although in the '04 there's only Cabernet and Cabernet Franc. 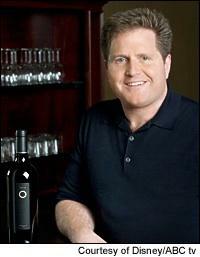 The wine is 30 months in all new French oak and Todd Graff [of Frank Family] is our winemaker. It's been a wonderful education and a fantastic journey for me. WS: What sort of wine stylistically are you trying to produce? SM: Interestingly enough I had the inspiration while drinking a Dal Forno. Obviously, as an Amarone, it's not similar to the Cabernets in Napa, but I was just fascinated by how much fruit Dal Forno gets. So we started talking about how we could capture that big, bold Cabernet flavor. We're big fans of Napa Cabernets like Schrader and Colgin, and based on those big and bold but not overpowering wines, we tried to craft our own wine. Having grown up in France, I really wanted it to speak to terroir and what the Rutherford Hill and Rutherford dust would give to it. We tried to remain faithful to that. WS: Were you hands-on with the winemaking? SM: I tried to get hands-on as much as they would let me. For me, it was really a fabulous education. I could ask every dumb question 20 times. My learning curve was enormously steep but gratifying. At the end of the day, I left the winemaking to Graff, but I tried to do everything from pick the grapes to pick out the stems and everything I could. WS: How did you first become interested in wine? SM: I grew up in France and have been kind of a wine nut. My father [the headmaster of the American School of Paris] moved the family there when I was 10 years old, and we lived there for seven years. He got fascinated about wines through Steven Spurrier and a whole contingent of ex-pats in Paris that were learning from him. We traveled through a lot of wine regions of Europe, and I just had a wonderful education about wine at a young age. Some people would be aghast at a 13-year-old sipping Burgundy, but my father was probably more proud of it than anything. WS: What are your wine passions these days? SM: I've become fascinated with branching out. Lately, I've been trying to find some great Grüner Veltliners. Living in California, I'm always looking for those nice summer whites. I love white Burgundies, but the prices have gone so high now. It's hard to open a $900 bottle of Montrachet. I think Spain is doing wonderful things right now, and Italy has been a passion of mine for a long time, I mean Masseto being maybe my all-time Italian favorite. WS: Are your friends and colleagues in the entertainment business generally into wine? SM: I've often said there are different kinds of wine enthusiasts in this business. There are people who are genuinely enthusiastic about wines and wine drinking and wine pairings, and then there are the kind of society wine drinkers for whom it's a status thing. It's about how expensive something is, or how hard to get something is. Everybody should just enjoy themselves is the way I see it.